No. Well . . . okay, for awhile it did. Or it almost did. But not for long. This is one of those "road not taken" posts. Not taken, and as a result . . . long forgotten. 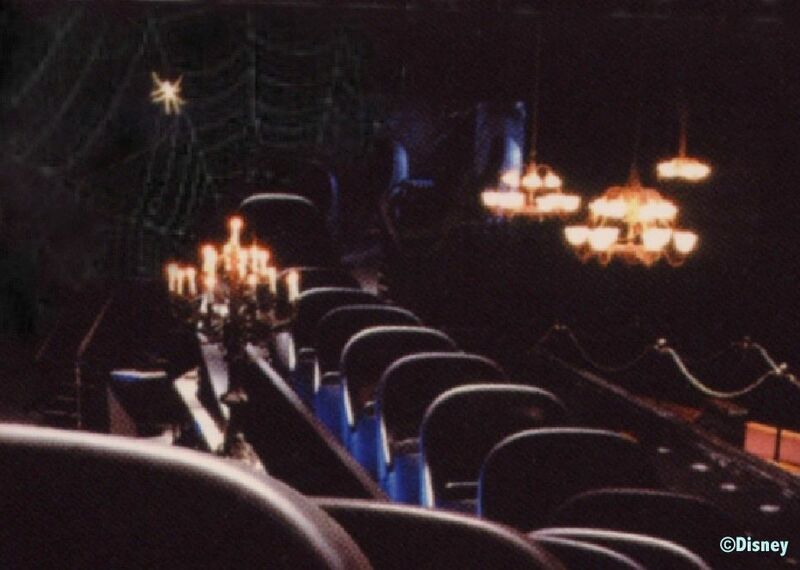 In our Walls and Stares post (May 2012), we talked about scaring people by resurrecting their childhood fears; in particular, how the Mansion takes wicked advantage of our propensity for finding frightening faces in seemingly innocent patterns and designs. Is this kind of psychological exploitation cruel or cool? Both, you say. That's it! It's crool. 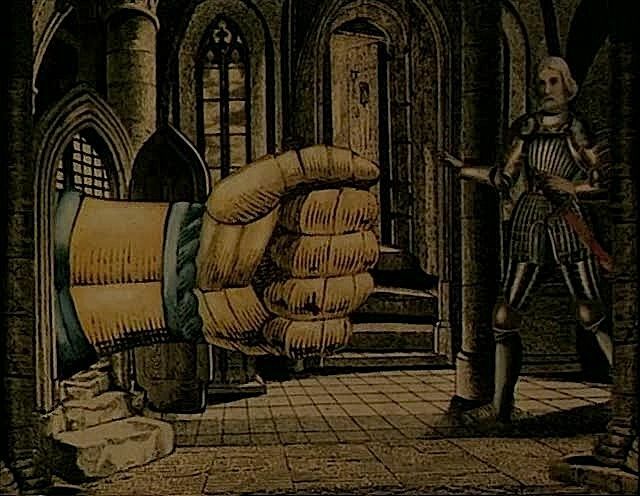 In this post we're going to discuss another crool strategy for giving folks goosebumps: intimidation through sheer size. My hunch is that this particular fear factor is another throwback to the vulnerability of childhood, of living in a grown-up world, where everything is (too) big. We already touched on this idea a few posts back as we scratched around for an explanation for the anomalous and absurdly oversized bass fiddle in the scale model of the HM attic and in Collin Campbell's artwork. As a scare tactic, "Big = Scary" is nothing new. It features prominently in the very first Gothic novel, Horace Walpole's The Castle of Otranto (1764), a book we have referenced before. 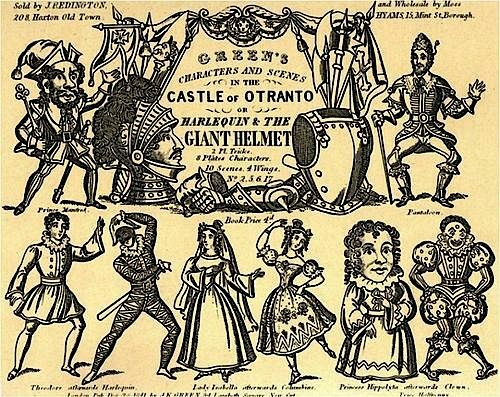 A giant helmet falls out of the sky and kills somebody right at the beginning of the book, and further humangous ghostly manifestations follow. You could say that spectacular size, plays a big, big role, as a horror device, in Horace Walpole. "No it doesn't. PAPER covers ROCK." 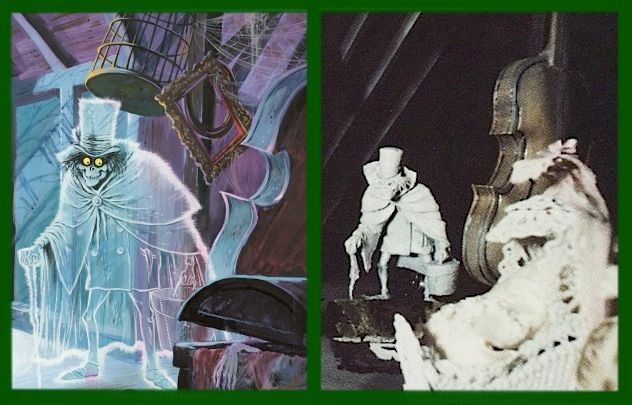 Whether or not the Imagineers were influenced by Walpole, some of them did consciously plan to use a similar strategy in the Haunted Mansion. As an Imagineering trick, it's a twisted, unfriendly reversal of forced perspective. With forced perspective, things that are actually small look larger than they are, but with size intimidation, grotesquely oversized things are used to make you feel smaller than you are. Have you got that, shrimp? At the Mansion, discussion of this strategy begins and ends in a familiar place. Time and again we've highlighted the "actually happening or your imagination?" dilemma posed by the stretching gallery. It's an essential key for understanding the experience in store for us. Either the ghosts have power to manipulate the very fabric of the building, or they are able to trick the mind, perhaps even induce hallucinations. Either of those prospects is scary enough, but our inability to even know which of the two is in operation only adds to the disorientation and unease. And so the table is set, and we're off and running on a haunted house adventure. Something we haven't discussed is the specific nature of the manipulation/hallucination. The room stretches. It gets bigger, much bigger. So one thing the gallery does is make you feel small. When the place is fully expanded, it really is an impressively big room. This is something I've particularly noticed in my most recent trips to Disneyland. The sense of smallness and vulnerability that guests are liable to feel reminds me of Alice during one of her shrinking episodes. As with her, it is like a dream that is turning into a nightmare. 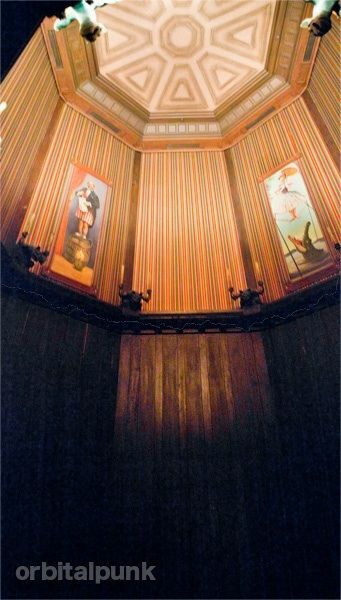 After the gallery finishes stretching, you are plunged into darkness for a few moments, and then you exit into the next room, the changing portrait hall, where everything is once again normal in size. You're still in a fear-inducing environment, but the specific sense of smallness is left behind. What you probably don't know is that once upon a time they seriously considered keeping you small and vulnerable, at least for awhile. 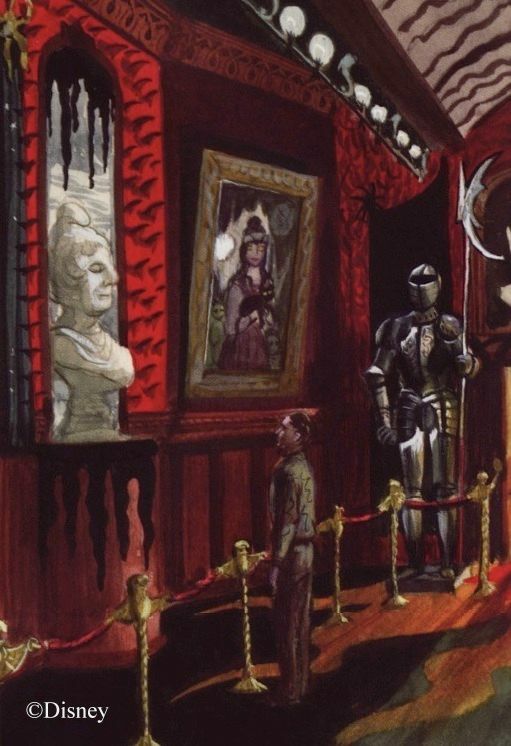 We know this, because in a 1964 show script, Marc Davis spoke of the portrait hall as a room "filled with oversized furnishings, paintings, and sculptures." In other words, everything was going to continue to look BIG. This would have been consistent with our experience in the stretching room, and the dilemma was going to become a trilemma: (1) Is the room really expanding? or (2) is it your imagination? or (3) are you shrinking? Interesting, but how could they have accomplished this gargantuan feat? Well, to begin with, they had plenty of room. The space where the changing portrait hall would eventually go was already there when they finished the 1962 façade building. 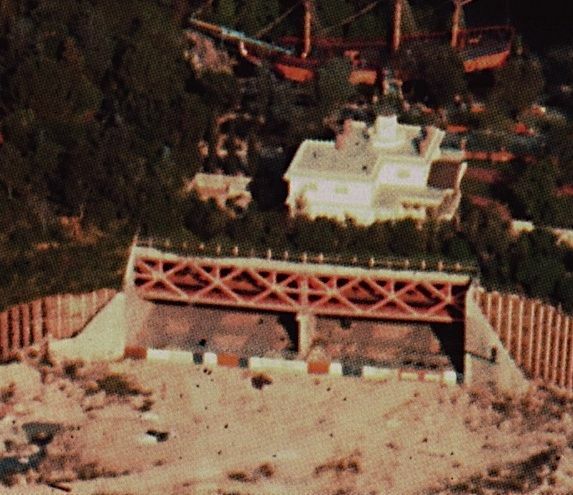 the railroad tracks was cleared, leading out to the area where the main show building would be constructed in 1968. 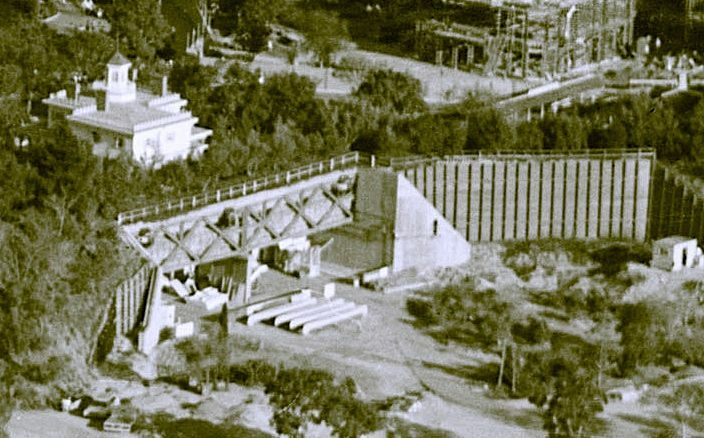 This is a 1964 photo. Hellooo-ooo in there -ere -ere -ere. Here's another view, from 1966 -ix -ix -ix. 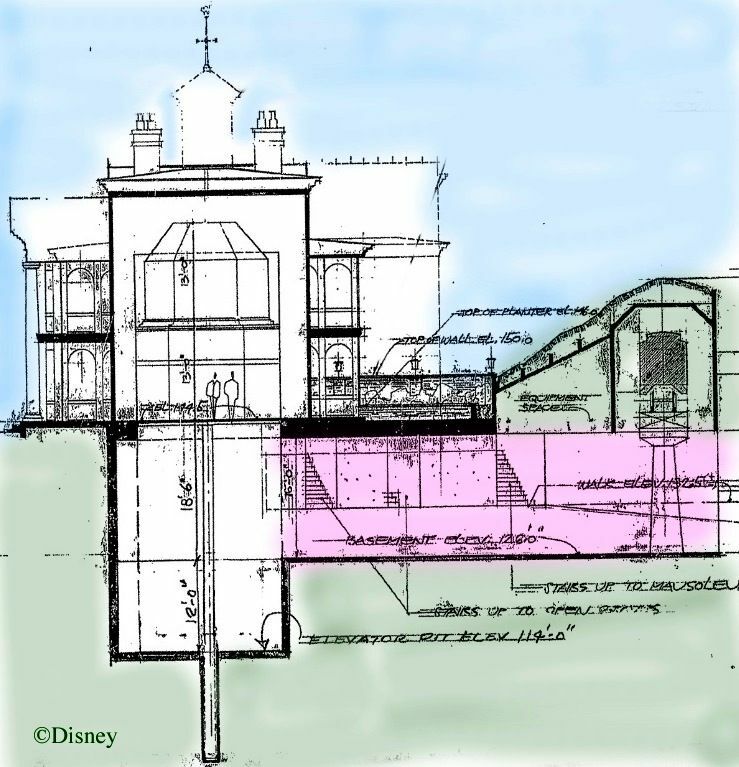 In those early years, the Haunted Mansion was going to be a walk-thru, and in order to handle the traffic, they were going to have two complete versions of the attraction side by side. (That's the original reason for building two stretching rooms.) So when you look at that open space, cut into halves by the trestle support in the center, you should also try to envision each side being further divided in half, making a total of four passageways coming out from under the tracks, because you need a departure corridor and a return corridor for each of the two walk-thrus (or should that be "walks-thru"? I'm a grammar freak; I should know this). Anyway, even after the division into four, each of the hallways would still have been an impressively large, cavernous structure with a high "ceiling" (i.e. the RR bridge). 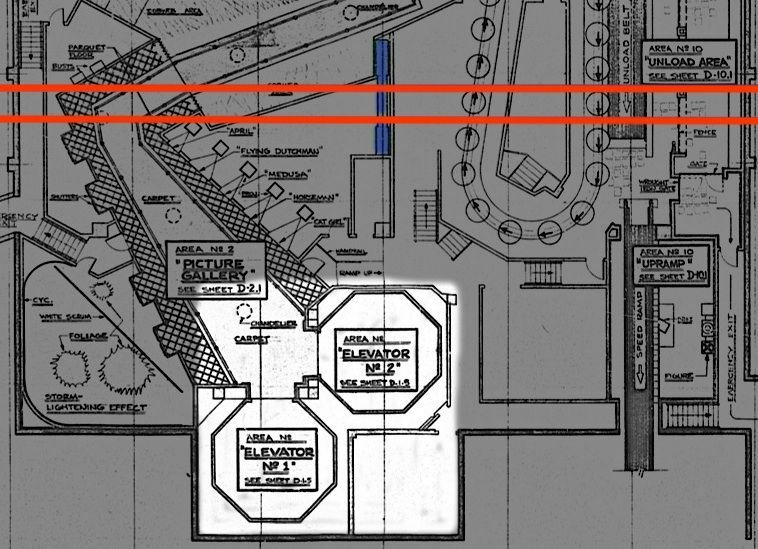 Not only that, but there are clear indications on the above blueprint that they intended to make the return hallways something much closer to a normal size for a house, thereby leaving even MORE room for the departure halls, which could be made that much loftier and wider. So the room following the stretching gallery would have been . . . BIG, perfect for Davis's oversized furniture and artwork. Already in Ken Anderson's ghost house, the hallway leading under the berm to the show building was going to be a changing portrait gallery, and as far as I can tell this plan was never altered. 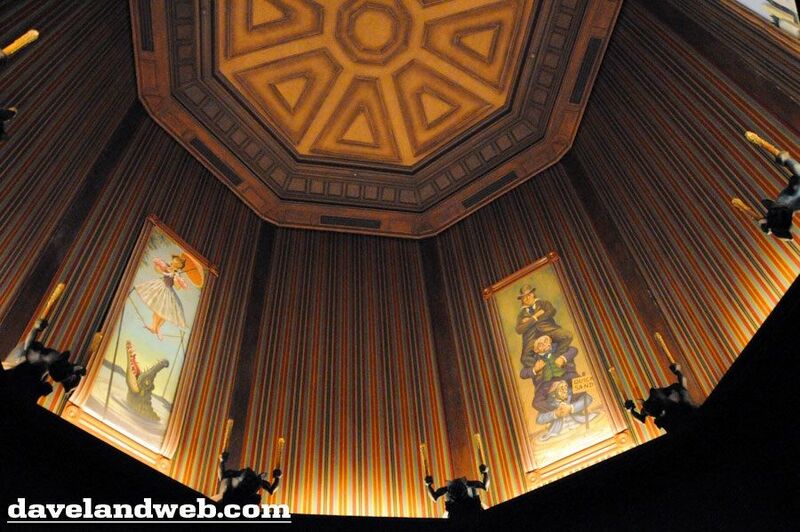 So it may be that the massive size of the area encouraged Imagineers to think of an equally massive room for the changing portraits. hall, it reflected this idea, although it's something very easy to miss. That room is bigger than it may look. Notice the size of the man on the left, and compare him with the suits of armor or the busts. "I'm feeling a little . . . little." the same approach, intimidation through sheer size. In fact, this sketch may illustrate the idea better than any other HM artwork. If you ask me, THAT is scary. It also illustrates well what is perhaps the greatest strength of this gimmick: repeatability. This scene feels intimidating no matter how many times you look at it. (It was bad enough to have that cat laughing at you continuously, but as soon as you went under his chair, he popped down in front of you on the other side, upside down. You can see him by the girl, already there.) 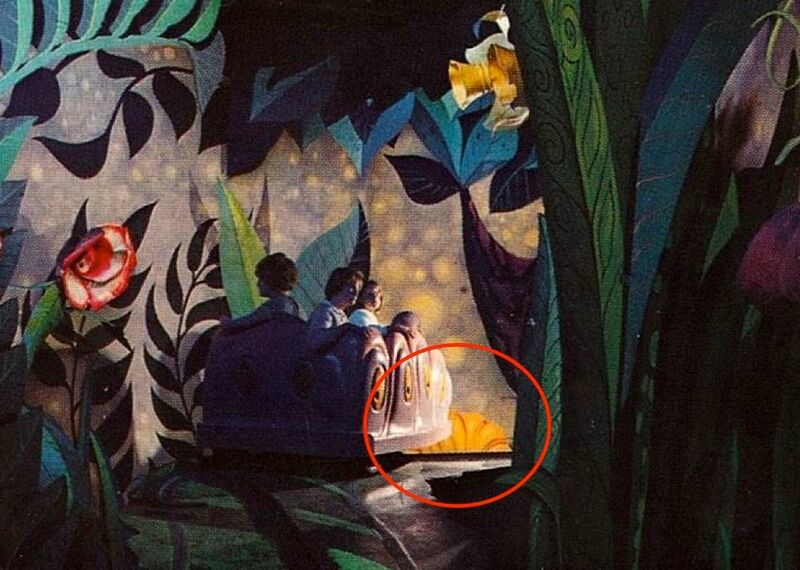 It's not surprising that this section of the original Alice ride featured a great Haunted Mansion forerunner: the first pop-up bogey in the park. Toward the end of the garden of live flowers, a Tiger Lily used to pop up on your left with a roar and a scowl. I've found no pictures, but in this one you can see the top of his head. He's poised and ready to jump. When I was a wee one, I had to close my eyes at this point. I'm not kidding. Anyway, back, back, back we go to the changing portrait hall, and plainly none of this oversizing was implemented. I don't know why. 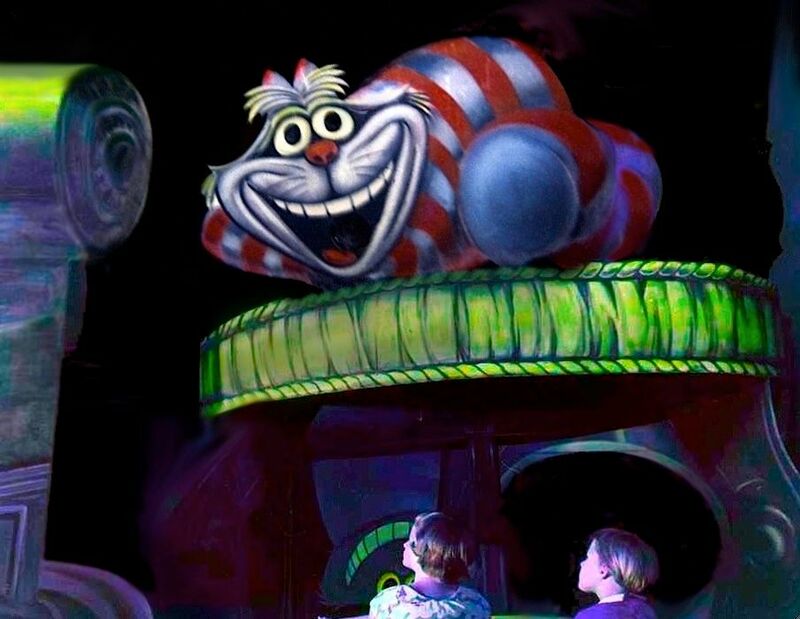 Perhaps they couldn't figure out how they would sustain this surrealistic motif for the entire ride, or perhaps they thought it would wear out its welcome after awhile. And when the ghosts finally materialized, what were they going to be, giant ghosts, à la Otranto? Then again, it could have been a purely practical decision. It must have taken a LOT of "padding" to prevent the sound and vibrations from the train from leaking through, so there was probably no way the ceiling could have remained quite so high as they may have liked. This is how the space was eventually utilized, with both elevators spilling into the same changing portrait hall, going off at an angle. The red shows approximately where the railroad tracks are, and the central trestle support is in blue. You might say that in the end, the changing portrait hall was not a big deal. You might also say, "Not one of your better puns." You might also say, "Get on with it." 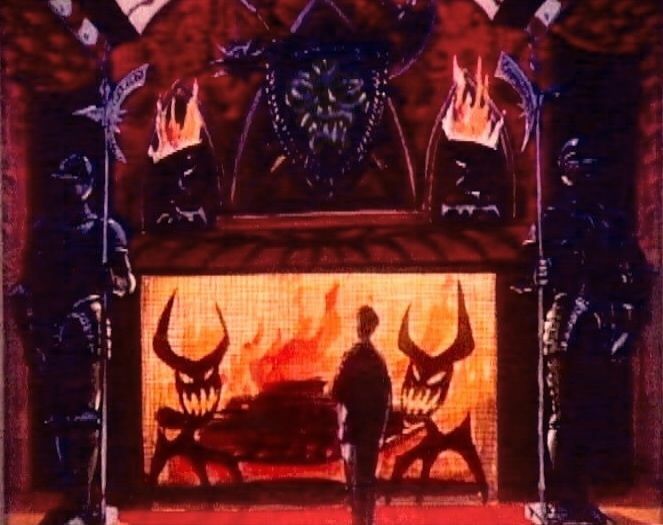 Okay, is there any place else where size intimidation made it into the Haunted Mansion? The stretching gallery is still there, of course, but it has no furnishings to set the true scale for the house, one way or the other. 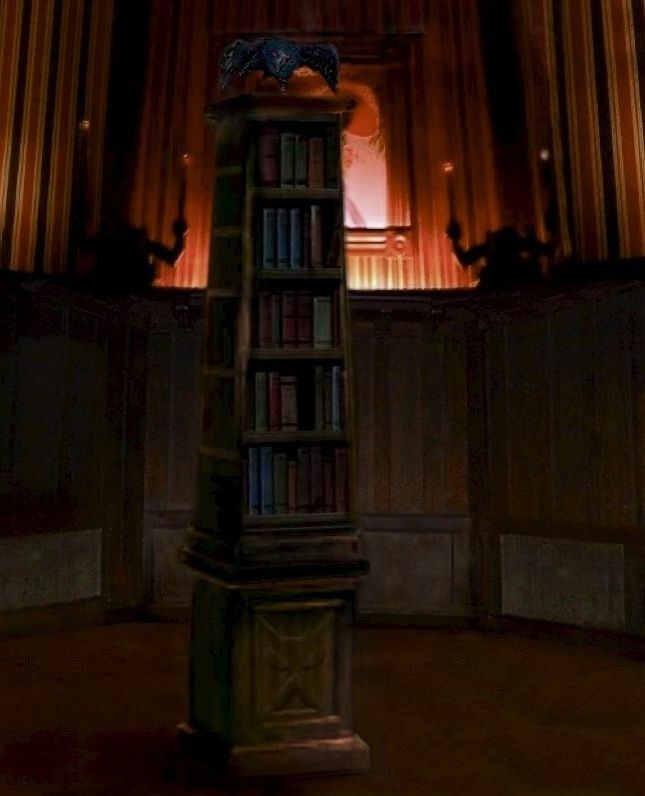 (But did you know they almost put a piece of furniture in there? See below.) There is a bass fiddle in the attic, but it is a normal size, so that prop didn't materialize. At eight and a half feet, the grandfather clock that we discussed a few posts back is tall, but not extraordinarily so. In their heyday, longcase clocks were commonly six to eight feet tall. 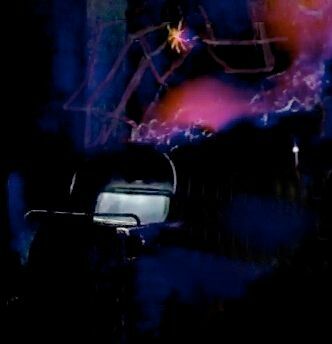 spider web with its oversized spider that framed the entrance of the doombuggies into the Limbo loading room until 2001. Tokyo still has its giant spiders further along in the ride, but WDW lost theirs to the Grand Staircase scene in 2007. I suppose that technically, "giant spiders" qualify as an example of size intimidation, but . . . meh. Weak example. They're alive, and therefore monsters, arachnophobic nightmares, not evidence that you are small. They're also campy Halloween decor, as we've discussed before, and you could even say they're a Disney cliché. If the spiders are all that's left of the size intimidation scare tactic, then there isn't much. So I guess that's it. We're pretty much done. Except I do have one idle speculation left, offered for what it's worth. It's always seemed odd to me that the so-called "Donald Duck chair" was designed absolutely from scratch. It seems like a lot of bother for such a relatively unimportant prop. Couldn't they have simply found an appropriate looking overstuffed chair and put the creepy embroidery designs on that? perhaps with a few other modifications? 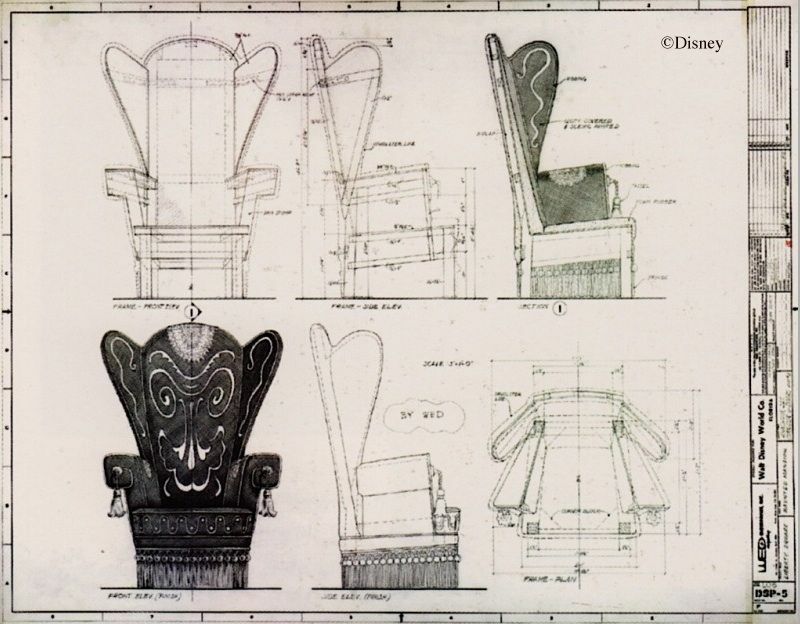 With its chunky wooden skeleton, it strikes me that the blueprints for the chair look like the sort of thing you might expect if it were originally going to be a huge, Alice-in-Wonderland-sized prop, one of Marc Davis's "oversized furnishings." I wonder. 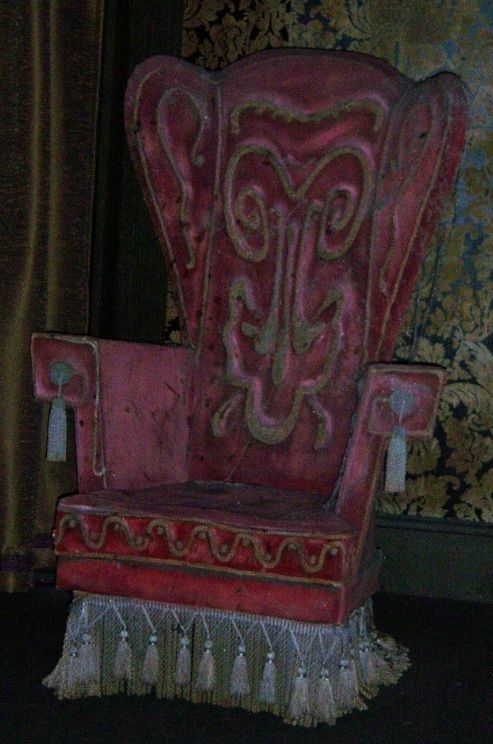 Is it possible that after the oversizing gimmick was scrapped, they salvaged their plans for a crool, sinister-looking, giant chair and simply scaled it down to normal size? 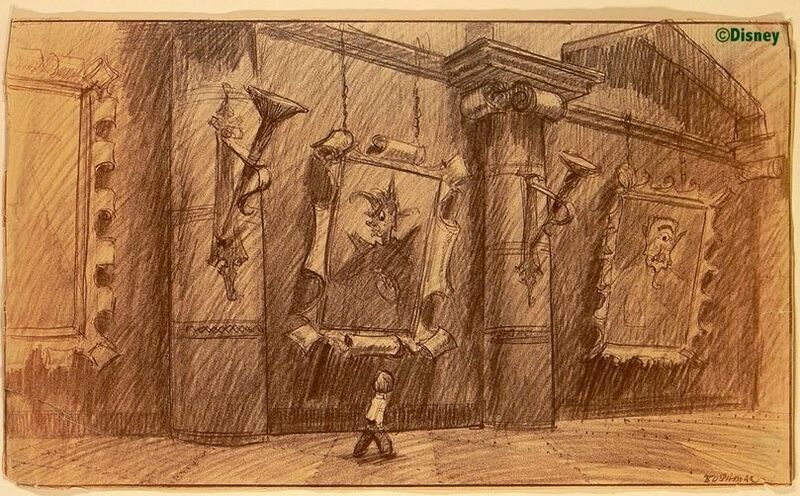 To judge by Davis's concept art, oversized = about twice normal size, so it would have been a simple matter of halving all of the original dimensions. sci-fi movies and TV shows, and doesn't this chair design have that same artificial, boxy look? 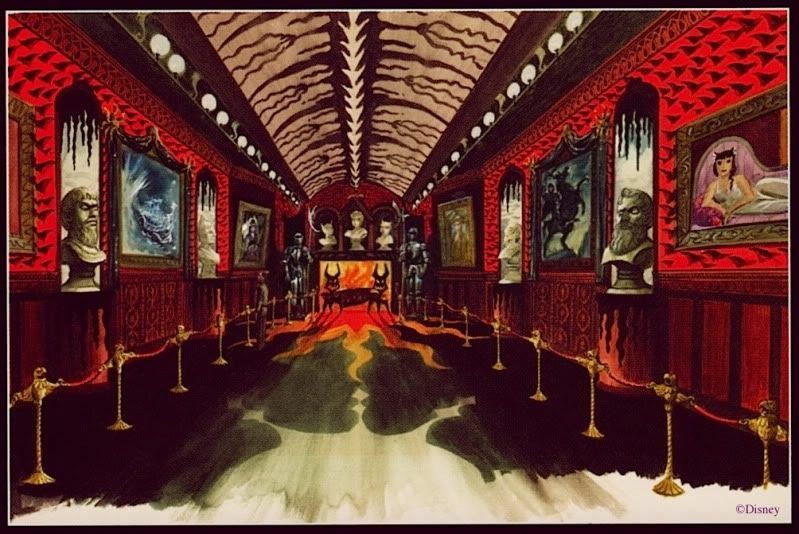 There is no furniture in the stretching gallery, but as late as the spring of 1969 they had plans to put a raven in there, taunting the Ghost Host. ("caw caw, the coward's way," etc.) Apparently the bird was going to be sitting on a bookcase. What kind of bookcase, and where they were going to put it, no one seems to know. For what it's worth, here's a photoshop photoslop I threw together. It at least gives you an idea of one way they could have done it. There must be artwork somewhere. It would be fun to know what they were actually going to do.